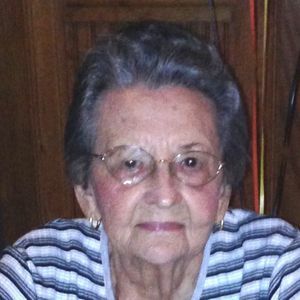 Isabelle Knaps Mars, 94 years old of Independence, Louisiana, passed away on Wednesday, April 10, 2019, in Ponchatoula. She was born on Monday, July 14, 1924, in Independence, Louisiana to Louis and Vaneta Pourciau Knaps. Isabelle enjoyed life and loved reading, praying, floral gardening and shopping but she especially loved spending time with her grandkids, great grandkids and her family. Isabelle is survived by her daughter, Jeanette Mars Garofalo and her husband Deacon Nat, her son Donald Mars Sr. and his wife Christine, her grandchildren, Dr. Genesa Garofalo Metcalf and her husband Garry, Jr., Chrystal Landgraf and her husband Ed, Donald Mars, Jr. and his wife Nichelle and Gabrielle Mars Ruiz, her great grandchildren, Blake Williams, Grant Abel, Justin Kain, Cohen Mars, Brody Mars, Maddie Mars and Brynlee Ruiz, her brother in law, Willie Morgan, Jr., also many nieces, nephews and close friends. Isabelle is preceded in death by her parents, Louis and Vaneta Pourciau Knaps, her husband Pierre Mars and her sister, Theresa Morgan. A Visitation for Isabelle will be held on Monday, April 15, 2019 from 9:00 am until 11:00 am at Mater Dolorosa Catholic Church in Independence. A Funeral Mass Celebrating Isabelle's Life will immediately follow visitation at 11:00 am in the church. Interment will follow at Colonial Cemetery Mausoleum in Independence. Isabelle's guest book can be viewed www.harrymckneely.com. I am so sorry for the loss of your Mother. I am praying for your Mother and for you and your family.